Smartphones offer many possibilities and we all love to install lots of apps, so it shouldn’t be a surprise that data consumption can sometimes skyrocket. However, performing a few basic settings, we can keep the data consumption at reasonable levels and get the most of it. Here there are a few simple adjustments not to spend all the MB of the month in a few days. If we don’t say otherwise, Google Play continuously updates its applications, and within days, hundreds of megabytes can be downloaded to update the apps that we have installed. To avoid this, we must restrict updates so that only start in case we are connected to a Wi-Fi network. 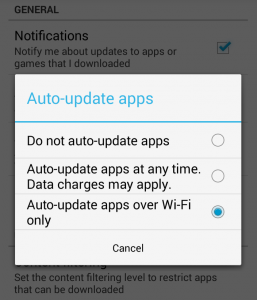 If we go to the Google Play settings, we will find the option to allow updates only when there is a Wi-Fi network available or to always ask before updating, so we’ll have full control over the downloaded files. Many applications, such as Gmail, Feedly, or Instagram among others, can synchronize with varying frequency. Every time they do, they consume data, so we have to choose a reasonable syncing frequency that fits our needs. Each of these applications has a configuration menu where we can choose whether we want to sync only if we have a Wi-Fi available, set a specific frequency or limit the updates when the app is not running. 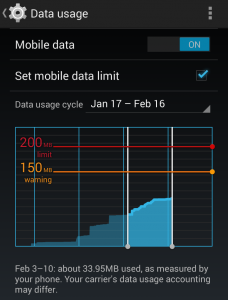 Android also offers the possibility of limiting the total mobile data consumed to fit our data plan. In the “data usage” of the settings menu, we will find information on the consumption rates of each application. 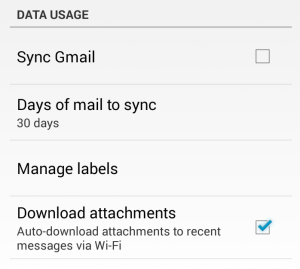 There is also an option to set a reminder at some consumed data level and block the data usage when we reach a defined data amount. These little settings will ensure no surprises at all on our phone bills.